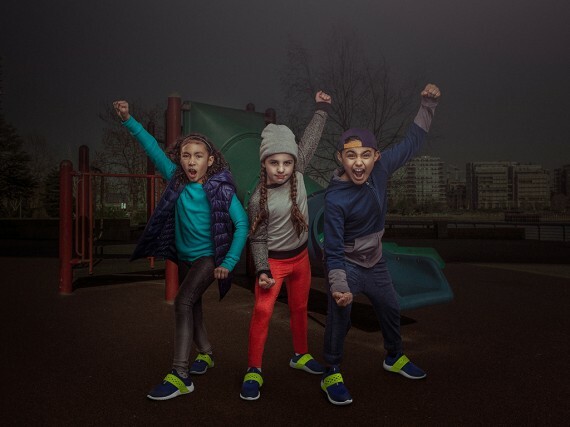 Super Heroic (www.superheroic.com), a new company based in Silicon Valley, has used technical and high performance design to create a sneaker line specifically for children, to encourage, enhance, and enable tactical play. The inaugural rollout of Super Heroic features the TMBLR v1 sneaker, the first of a larger collection of products, which will include footwear, apparel and accessories – enhanced by content, technology and partnerships all pointed towards the goal of encouraging and enabling imaginative play. Super Heroic was born under the philosophy of giving kids a new uniform for play, empowering each and every kid (and their parents) to unleash their inner superhero, showing families how to tap into the hidden powers of play. For more than fifty years, children’s playtime has been declining. Lack of play affects emotional development, leading to a rise of anxiety, depression, and problems with attention and self- control. Super Heroic aims to reverse this decline, one play day at a time, and creating collaborative and cross-cultural experiences through its League of Play events around the country. The TMBLR v1 is the first-ever performance grade shoe specifically designed to fit the needs of a child’s foot. The sole of the shoe is made to navigate multiple surfaces with midsole sidewall traction ridges for maximum grip as a child is climbing a slide or running across the playground. And instead of laces, the TMBLR v1 closes with a utility strap that provides security without restriction and has a dual density midsole, which aids multi-directional movement, and an offset durable rubber outsole that adds stability when met with an uneven surface. Its unique, silo packaging system comes equipped with a backpack that morphs into a cape for each young superhero. Super Heroic is available exclusively online at www.superheroic.com. The TMBLR v1, offered in limited quantities in sizes 12C-7Y, is priced at $99 and shipped starting August 15, 2017.